Hi Everyone!! !! Today's Guest is Kim, Interior Designer, and author of Design Thoughts. Take a minute to read all about "Creating a story, mixing old and new" and to check out her wonderful site filled with DIY projects, Enjoyables and Mommy moments! Thanks M!!! Hi Mod-Sters! My name is Kim, I write a blog called Design Thoughts, and I am so excited to be guest at Mod Design Guru today! 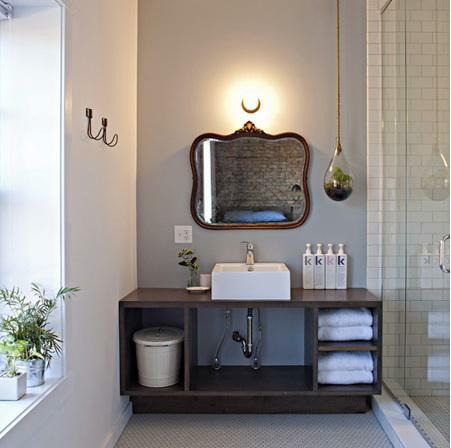 My favorite way to do this, to bring meaning to a space, is to go beyond smart design, go beyond brilliant space planning and perfect pieces, and add a little vintage. Although, "antiquing" is all the rage right now, which is driving up the cost of old pieces, you can still find some amazing little gems, at very little cost, that not only add a story to your home, but also add a little character. Take a look at one of my recent finds, when I saw them in my "go to" Junk Shop called “The Saturday Junk Shop" I knew I had to have them! They are fiery and little and absolutely called to me! How amazing would these look on somebody’s Espresso bar? I KNOW!! The Story: These little beauties are from the 1950's. Purchased by the Sat. Junk Shop (or TSJS) from a former set designer for Broadway, these little cuppies shared the spotlight in one of the most iconic parts of New York City.....BROADWAY. !!! 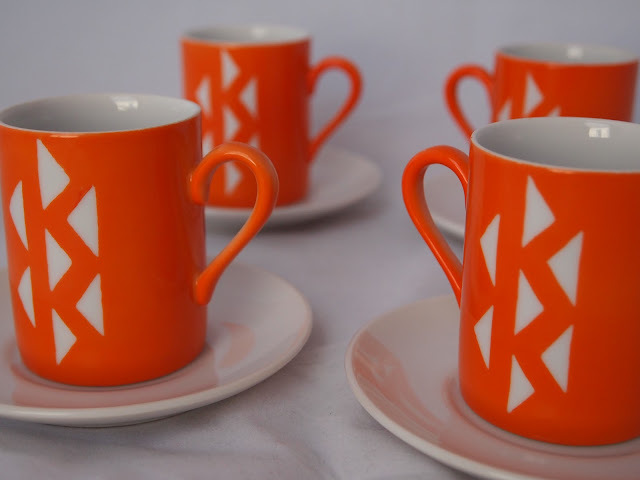 So when you take a sip of your Espresso from these tiny orange treasures, you will know that they once held a spot long long ago on the big stage :) So cool right? Now, the fun part? A set of 8 of these cups with the saucers, are selling in the price range of $75-$100 for the set. So take a little guess how much my (4) piece set costs....$6 WHAT!!! Just one example of how you can add meaning, by adding a "story". Here are a few examples in spaces that I think got it right. A perfect mix of New and Old, and although I don’t know the stories behind the pieces in these photos, it doesn’t matter, the point is, they make me want to KNOW the story!! 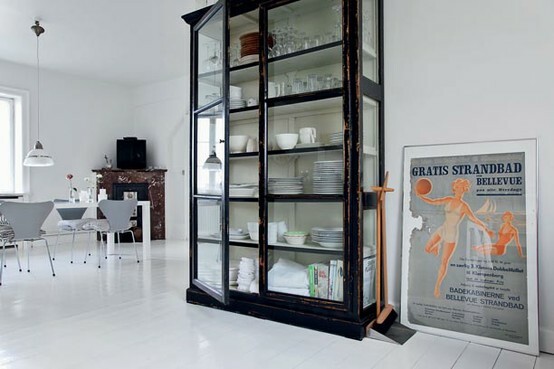 LOVE this amazing antique china cabinet, mixed into this ULTRA modern space! I LOVE LOVE LOVE IT!! I love the mix of textures, the mix of light modern, next to dark antique!! I KNOW there must be a story behind that piece! 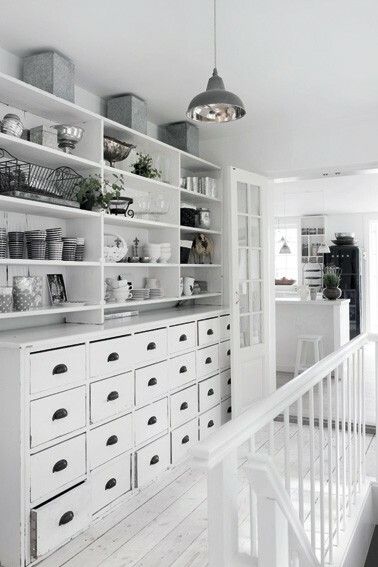 How about this beautiful, crisp, white storage space outside a kitchen? Modern dishes, accessories, lighting and color scheme, mixed with an old storage cabinet, to add that perfect balance. So what are your thoughts?? Do you like to stick with one style? Or do you like to mix it up? Do you like modern mixed with vintage? Whatever your style preference, look around your home…does it tell a story? I hope so! If it doesn’t, start creating one!! Love it! I am so loving the idea of small pieces that tell a story. Right now, my world tells the story that I am a momma of little kids - scratches, finger prints - and I love the meaning behind each litle imperfection. I am going to keep my eyes open for pieces that help tell the story of my little family - thanks for sharing!